It was a pretty good opener. The ending sequence saw Big E throw Kofi Kingston to the floor and wipe out a few guys, Tyler Breeze hit a supermodel kick, Fandango hit the ropes, but then eat a kick to the head by an Uso and get rolled up for the finish. The crowd was really behind New Day, and The Usos played the heels well. English was getting almost booed out of the building with his singing. He was excellent at milking a reaction as the fans got louder. Dillinger came out and was really over. He held up a 10 sign that English took, but Dillinger kept bringing out playing cards with 10 on them. This was a pretty long match actually, and the crowd never got tired either. It was a solid back-and-forth match that saw English counter the Tye Breaker with an eye rake and hit a front facelock drop for the win. The crowd really wanted to see Zayn in the ring, but the heels worked over both Hype Bros before Zayn got a hot tag. Rowan countered a double suplex by the Hype Bros and ended up suplexing them both instead. Zack Ryder hit a Rough Ryder on Konnor, then Zayn hit a Helluva Kick on Viktor for the win. The Ascension said they weren’t done after that and would fight any man, woman, or child, but that changed to them challenging the biggest man in the back, so Luke Harper came out. Viktor told Konnor good luck and bailed as Harper hit a clothesline and got a quick pin. Harper got a good amount of cheers from the crowd. The reaction Nakamura got was nuts. His entrance, even at a house show, is great. Styles got a huge reaction too. All three guys weren't in the ring together all that much. 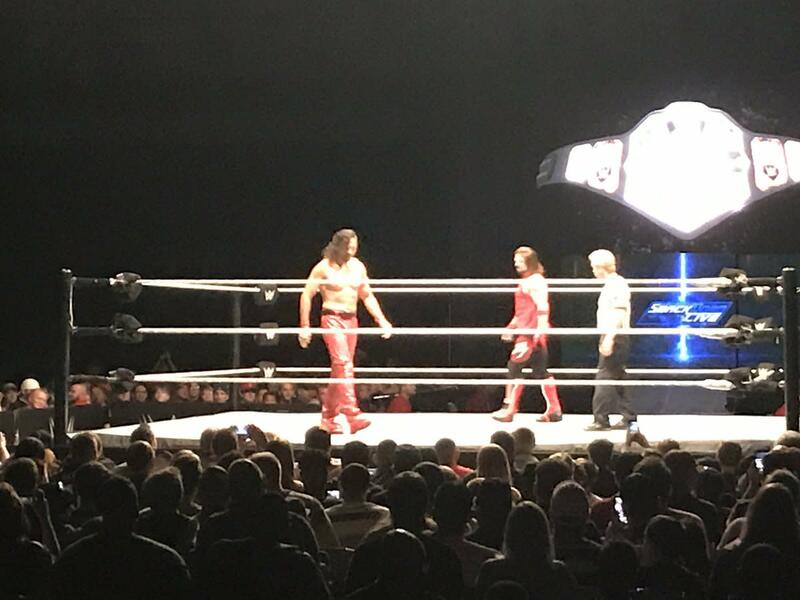 Styles and Nakamura squared off and got a big reaction as they traded moves briefly before Corbin put a stop to the fun. Tamina got zero reaction, though she barely worked the crowd. Natalya was the one interacting more with the crowd, as she got booed quite a bit. Charlotte took out Tamina while Naomi hit the Rear View on Natalya for the win. Roode's entrance music was seemingly stopped early as he just posed for the crowd in the ring and then it stopped, which was weird. Ziggler ran down the crowd and pretty much said his promo from two weeks ago on SmackDown verbatim. The action was super slow for the first half as Ziggler pretty much sucked the energy out of the crowd with rest holds. Roode made his comeback as the crowd slowly picked back up. Ziggler went for a superkick near the finish, but Roode blocked it and hit a spinebuster followed by a Glorious DDT for the win in what turned out to be a decent match. During Orton’s entrance, he stopped and made the camera guy show a sign a kid had that said “Kevin Owens is the World’s Worst Wrestler” as Orton smiled and sort of nodded. I really wanted to like this match, but I couldn’t. It didn't make much sense with the Singhs distracting the referee and Mahal doing rest holds. They traded throwing each other into the steps, traded kendo stick shots, and traded chair shots to the gut and back. Finally, the end saw the Singhs toss a table in, Mahal grab it to fold out a leg, but it broke clean off. He told them to get another, but there wasn't one. Mahal finally set the table up in the corner and eventually got suplexed through it. This was when one of the Singhs distracted the ref while trying to help Mahal up, the other hit a low blow on Orton, and Orton couldn’t get up at the count of 10. Mahal won and they all put the boots to Orton for about 10 seconds before he threw a Singh out of the ring and hit quick RKOs on Mahal and the other Singh to end the show.